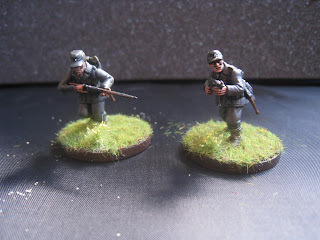 Adam and I had our first crack at playing Force on Force last night, He was in charge of most of a squad of marines, whereas I was using some Gerbigsjager which I had freshly painted. 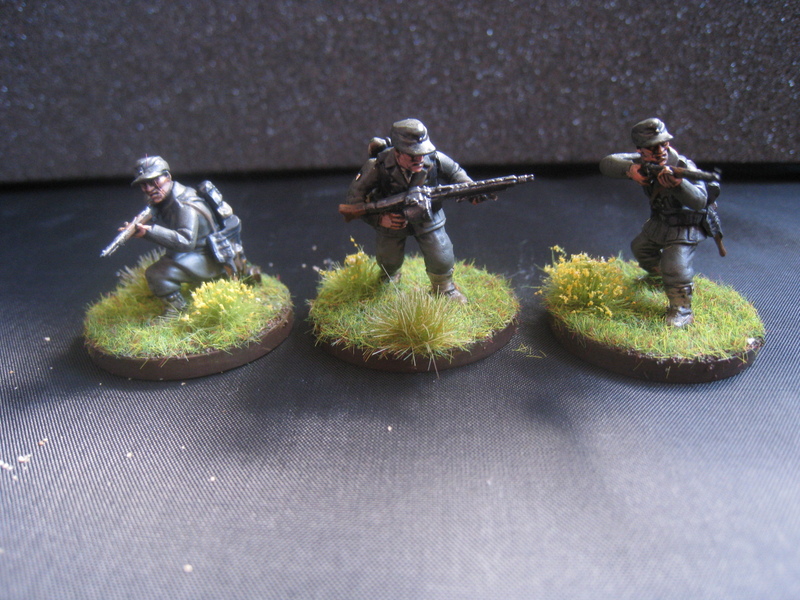 A two man team one with a rifle, one with an MP40, who will be joined by the Officer. Well, both Adam and I thought we had a good handle on the rules before the game began, only to find that we really didn't know what we were talking about! So our first play through was very, very stop/start with much looking in rulebooks to find out what we were actually meant to be doing! The first match up was 8 D8/D8 Marines against 6 D10/D8 Gerbigsjager. We put down what we thought was a reasonable amount of terrain, and we spent a fair bit of time shooting each other from it! Adam had his force in two fireteams (not that the term existed in WW2 like it does now), one with a Rifle Grenade and a BAR, the other with an NCO with a combat shotgun. Very quickly, we found the superior trained Germans were able to counter act their poor numbers and poorer firepower by rolling a 9 or a 10! So that kept his support team pinned, leaving his assault platoon to hit my picket without damage. Close Assault in FoF is very, very vicious (as referenced in the title...) Simply, it removes one aspect of the game, first aid. If you become a casualty and your side loses the combat; you are either dead, or a POW. And there is not a high chance of being a POW. The second and third match ups were based around both sides having equal training, but the marines having to attack a fortified position. Which sounds like it could be good to be German, except that in turn one of game 2, one of Adams fire teams slaughtered my entire force! I had one private with an MG42 left at the end of turn 1! Moral of the story for game 2? Cover is good, but rolling a successful initiative test to fire first is better. Game 3 was much more interesting. I changed my squads to having a Weapons Team with an MG42 and 2 men, and a fire team of 4 men with the 2 MP40s. This game was much more even, the MG42 team was pumping out 6 dice per turn (2 men, 3 for the weapon, 1 for optimum range) at the enemy, and through successful initiative rolls, was doing it as soon as the Marines hit the treeline. The Weapons team did eventually fall to a vicious assault, but they were avenged by the squad, who cut through the enemy marines with their 2 MP40s in close assault (learn to love it). Force on Force was fun, for Adam's report head here. Also, Jason I did do some research on your Type 99 LMG, and the bayonet lug is historical. And ridiculous. As for what next? Well there is 3 days left in the Analogue Painting Challenge. So, I will get a SAGA Dark Ages army done and more Greeks so I can use them for Impetvs. If you particularly want to see my take on a hero of the Trojan War, tell me who you want to see in the comments! At any rate,if I finish all of that it will be a miracle! 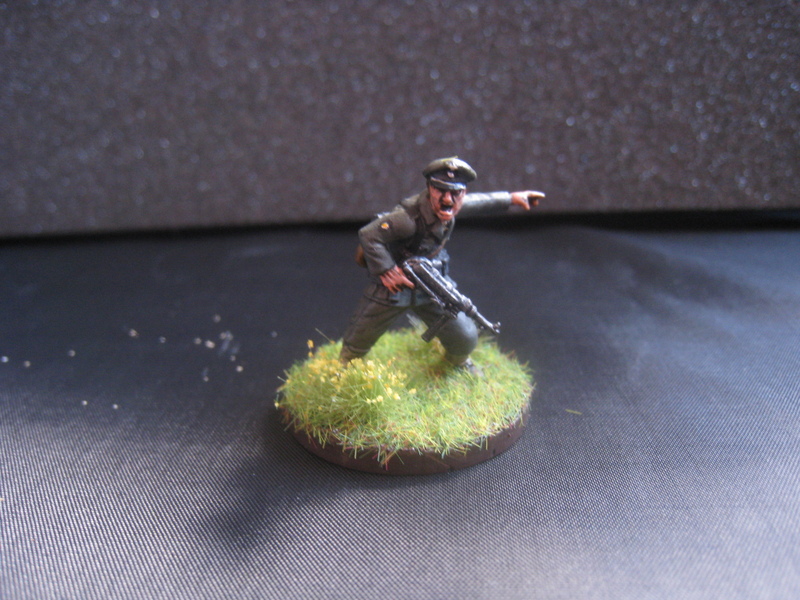 Marines vs Germans, so I could do some Soviets? What do they get? Coins to flip, in lieu of D2s? Depends on what time of the war- conscripts would be a D6, elite are more around the D8. You could definitly do Soviets- I have Germans and I know John has invested in some Hungarians, so some Soviets would go down a treat! Building +1d only, not in addition to cover as far as I can tell. SMG's and shotty's are d6 beyond optimum, which I don't think came up for us. That make sense about the SMGs, they should be a bit more rubbish at range! I was under the impression crew served HMGs were plus 3 dice, not just plus 2? Not sure. I plan to do a good reread of the book now! Marines are always down for killin' commies. Or anyone else you point them at. Thats warmongering if ever i saw it! I am going to guess many Soviets really didnt get what the manifesto was really talking about either, dialectical materialism doesnt come up alot when you are a turnip farmer! Or my favourite bit: "everlasting uncertainty and agitation distinguish the bourgeois epoch from all earlier ones. All fixed, fast-frozen relations, with their train of ancient and venerable prejudices and opinions, are swept away, all new-formed ones become antiquated before they can ossify. All that is solid melts into air, all that is holy is profaned..."
Anyway, yes I've seen some very cool Artizan figs (since I can't find the bolt-action scouts that I've seen pictured somewhere) and just need to decide on Scouts or ordinary LW infantry. How many figs should I shoot for? Of course I know the answers to my questions are: 1. Both, then more. And 2. Ill you ever have enough? So I really mean, what do I need to get started with? 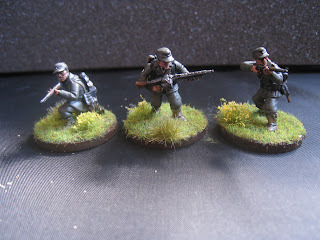 Aim for 2 squads plus support, so 2 squads of infantry then add a sniper, maxim HMG, PTRD AT rifle, scouts.... But the core of the game is the infantry. I think that you (Jamie) know that D-M is Lenin. You also know that the CCCP was not Marxist, but Marxist-Leninist. I was referencing the oft quoted fact that many Americans will mistake several passages from 'The Communist Manifesto' as being from the US Declaration of Independence. But I agree with Pooch, make an elite infantry unit like Spetsnaz of some sort or Paras or Naval Infantry. Then we can throw down on Sakhalin Island. So both, you say? I am not a fan of that Warlod box but do like the artizan packs and the Warlord Command pack (which Maelstrom doesn't have :( ). So will just get howwever many Artizan paks, that I need for now. Squad - as in two teams? Or Squad as in one team? So you are talking 16 odd figs? A Squad is 10 men. All of us have two squads plus support- the likes of an HMG. Don't worry about mortars, they are off table. You could have 1 LMG per squad if you are representing a well equipped unit, then to be honest making your scouts a small unit (8 max?) with SMGs should give you some good variety in game terms. FoF is totally scenario driven- so having lots of firepower doesn't mean you will win, but it does really help! I don't suppose engineers in body armour are something that can be modelled with the rules? I'll look into it, but it could be 1 or 2d of defense bonus. A very big deal. Equivalent to a building or a fortified building! After going to the Great Patriotic War museum yesterday I may have to do some Soviet Naval Infantry! Ooorah! Warlord brought out some cool bodyarmoured figs... I don't think they'd be anywhere near as protected as being in actual cover though - just a little more protected. I was looking at the Naval Infantry figs too - very cool, you should totally do some, at some stage. The armour was not in any way comprable to our current equipment, so I don't think it would warrant a defense bonus at long ranges. However in close assault, a bonus defense dice would be the way I would do it. Considering they are already well equipped with SMGs, they are going to be ruthless in assault! Plus, the models look pretty good.